Drammatic Organic Plant Food with Kelp is an all natural 100% organic liquid fish fertilizer with kelp added to provide even more micronutrients, vitamins and hormones which are beneficial to optimal plant growth. Kelp contains naturally occurring compounds that can make nutrients more available to plants, prolong shelf life of fruits and vegetables, increase resistance to insects and disease, and improve soil structure. Researchers and gardeners agree that a mixture of fish and kelp is one of the best combinations known for an effective, 100% natural organic fertilizer. Available in one or five gallon containers. OMRI Listed. 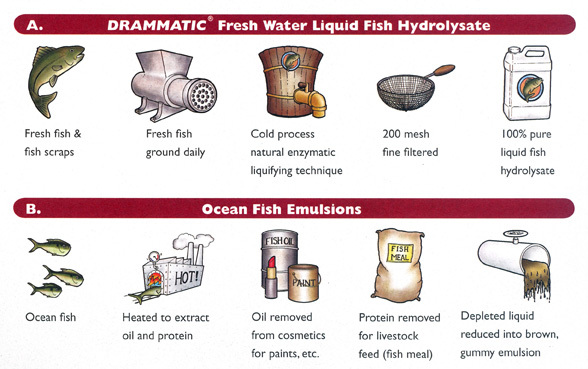 I am so pleased to have found this all natural 100% organic liquid fish fertilizer, which contains all the natural oils, amino acids, nutrients and minerals that were missing in the brown sludge waste product I previously used. I use it to feed my tomato and cucumber plants. Shipping was SUPER FAST! I purchased 5 gallons which came in (2) 2 1/2 gallon jugs. The packaging was fantastic to contain any possible spills which was very minimal. However 1 of the jugs was missing about 1/2 gallon. Called and explained my the situation; they were very courteous and made the situation right. Thank you!! My plants love this stuff. It's the only type of liquid fertilizer I am currently using. It does have an order. If you have a sensitive nose like I do, the smell can be a bit much. The smell doesn't linger too long. Have used this on vegetable, herbs and flowers I started inside earlier this spring. No overpowering odor, no burning and good growth. Tomatoes are growing especially well. Special thanks for the quick shipping!! I grow plumeria for a hobby. Kelp is a complete fertilizer. It contains over 70 vitamins and minerals and is one of the best fertilizers for its natural plant hormones. There is a noticeable difference in my plants when I use Drammatic K fertilizer. I grow organic crops and flowers. I wouldn't think of growing anything without Fish Enzyme and kelp. The benefits are too many to list here. We just started using this in our organic nursery. Our plants seem to respond to it well. Since its OMRI listed it's safe for us to use.